As one of the world's largest manufacturers of pet safety and management products, PetSafe offers many pet access solutions. We offer the PetSafe Classic Pet Door and the Smart Door Electronic Pet Door, both of which are inexpensive and a good value for the money. The Smart Door is our most economical automatic pet door, available in two sizes for door or wall installations. 5 5/8" x 9 5/8"
8 5/8" x 13 1/2"
10 7/8" x 17 5/8"
14 1/4" x 25 1/4"
15 3/4" x 23 1/2"
► PetSafe Classic Pet Doors are available in Satin (brushed aluminum) or White. 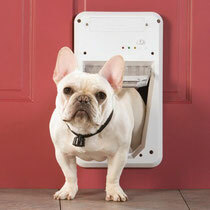 ► PetSafe Smart Door Electronic Pet Doors are available in White only. The PetSafe Classic Door has a 'self-framing' adjustment range that is very broad: 1/16" - 2", making this pet door particularly suitable for installation in unusual situations like thin metal kick-panels or heavy mesh security grills. The included locking cover is a composite material that is extremely strong and insulates well. Sizes larger than small provide two separate spring-loaded dead-bolt locks for added security. The slot that the cover slides into over the flap is a patented 'J' shape to make kicking out from the outside virtually impossible. The lightweight flap also makes the Classic Pet Door suitable for sharing by different sized animals, including adult cats. 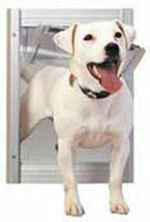 The PetSafe Electronic Smart Door recognizes the collar "SmartKey" on your dog and unlocks to allow your dog access. The sensing range is adjustable up to 3 feet. After your pet passes through, the door will relock again automatically. Animals without the Smart Key are not able to enter. You may have a total of 5 Smart Keys in use at one time. Each Smart Door includes one collar key. The collar key does not interfere with electric dog fences, or invisible fencing. Some newer Invisible Fence brand collars can act as collar keys for the Smart Door, as both are made by PetSafe. The design of this electronic door is particularly clever and effective. The flap actually descends over a ridge in the frame beneath the flap. The important result is that it is quite rigidly fixed and cannot be pushed open in either direction. A major significance of this fact is that we expect the door to be raccoon-proof, since access is controlled in both directions. Power is provided by "D" cell batteries. There is no low battery indicator on the Electronic Smart Door so it might be useful to keep a spare collar key nearby to use for testing purposes. When the activation range begins to decrease it's time to change the batteries. NOTE: PetSafe has advised us that these products may be installed in a metal door with some reduction in the sensing range.